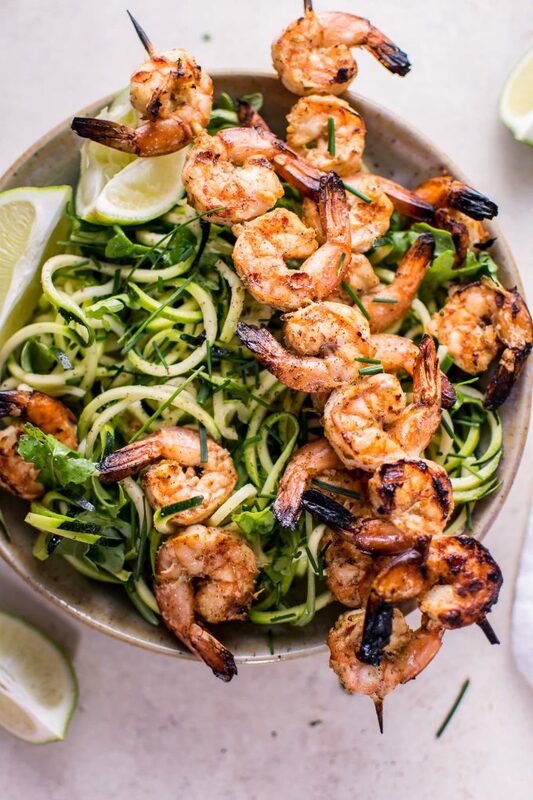 These grilled chili lime shrimp zoodles are an easy, summery, refreshing low-carb dish that’s full of flavor! Another day, another zucchini noodles recipe! You guys seem to respond well to my zoodles recipes, so I’m going to keep them coming. This dish is basically a salad with delicious grilled shrimp on top. 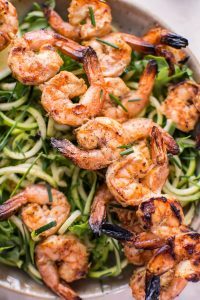 I toss the zoodles and arugula in a light dressing, throw in some fresh chives, and then top it with these fabulous shrimp skewers. The shrimp are marinated in a yummy chili-lime marinade. As always, I go fairly conservative on the spice, but you can feel free to add more chili powder if you like it hot. You don’t have to heat your kitchen up at all with this dish. Throw the shrimp on the barbie and you’re good. 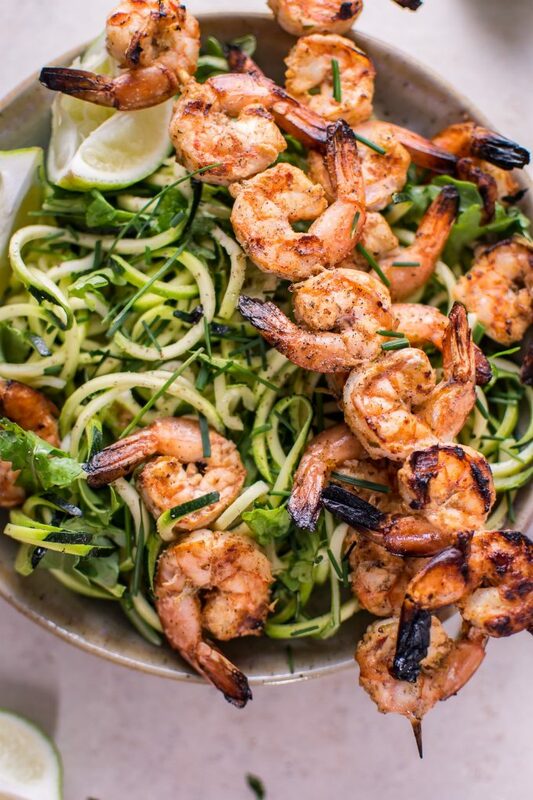 Enjoy these grilled chili lime shrimp zoodles with a glass of white wine! I’m loving this warmer weather. I still have yet to venture out to a patio, but I am getting outside so much more now. I can best be described as “indoorsy”, but I’m ok outside as long as I’m not too far away from civilization. I need sunshine! I managed to get my first spring sunburn on our first warm day of the year. Way to go, Natasha. 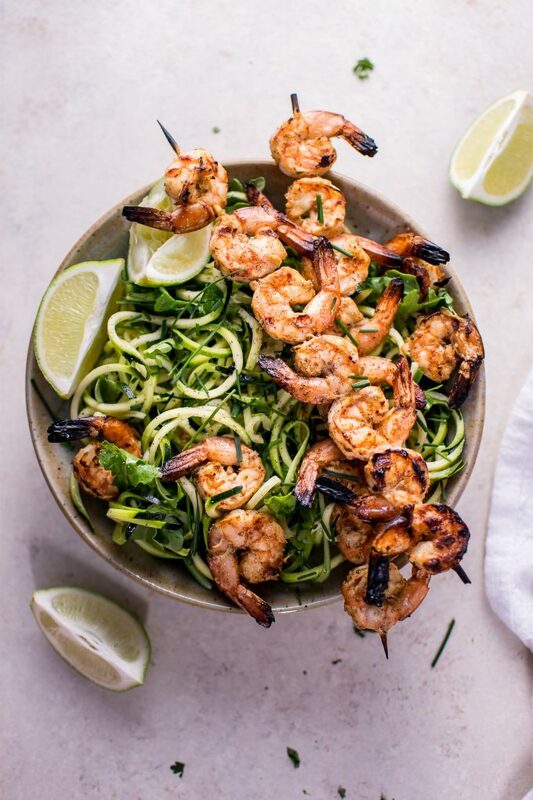 These grilled chili lime shrimp zoodles are an easy, summery, refreshing low-carb dish that's full of flavor! Add marinade ingredients to a Ziploc bag. Shake to combine then add the shrimp and toss until they're coated. Marinate for 30 minutes - 1 hour. Don't leave them too long or their texture can change. If using wooden skewers, soak them for 30 minutes to prevent burning and splintering. While the shrimp are marinating, you can prep your other ingredients. Spiralize the zucchini on the medium setting and add to a bowl, along with the arugula. Add the dressing ingredients to a small bowl and mix using a spoon. Once the shrimp are done marinating, thread them onto the skewers. Preheat your BBQ/grill to high, and grill for 2 min/side with the lid down (I like mine with a little char) or until they're cooked to your liking. Pour the dressing over the zoodles and arugula and toss to coat. You can take the shrimp off the skewers or leave them on. Serve immediately. Every BBQ/grill/grill pan is different, so please take my cooking time as a guideline only and ensure that your shrimp are cooked to your liking. I use a gas BBQ. Serves 2 as an entree or 4 as an appetizer. If you’re into shrimp zoodles, you can also try my 15 minute garlic shrimp zoodles recipe. Yum! I love zoodles (especially raw) so I’m loving this simple dish with chili lime shrimp! I also got a sunburn as soon as the weather got warm. It happens to me every single year.. you’d think I’d learn by now! 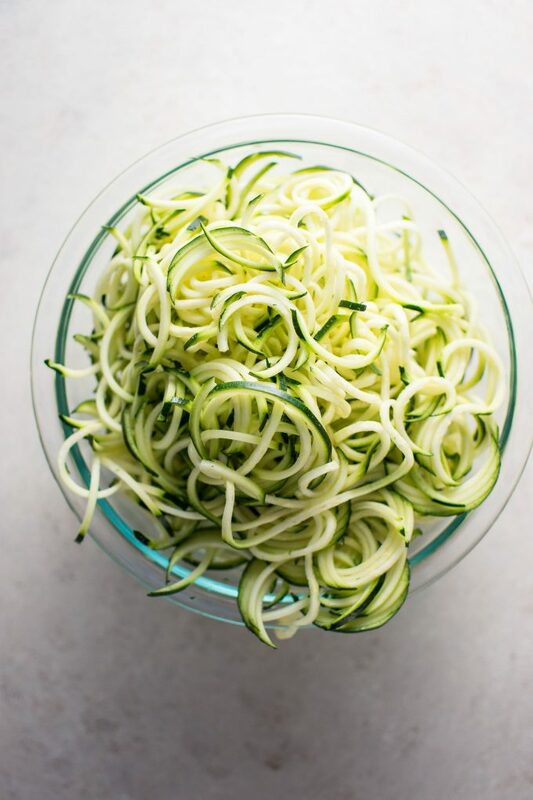 You’re obsessed with your spiralizer. Are you ever going to make something with it for me?? Oh. Em. Gee. This looks delish!